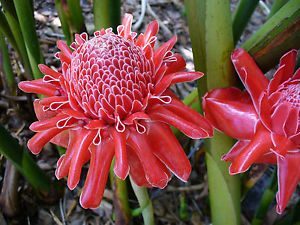 Known as the torch ginger for it’s long flowering cane and roundish, unusual torch like flower head. 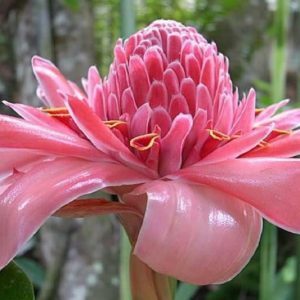 It’s flowering bract can range in colors of pink,red,white and pastel shades as well as assorted shapes and sizes of torch and tulip shape. 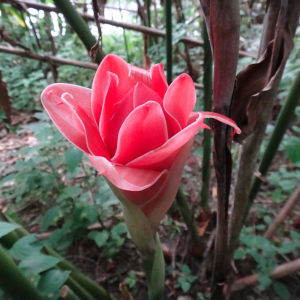 It is a large growing ginger that can attain heights of 8 to14′. 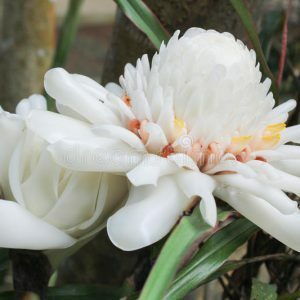 The flowers and buds are edible and flavorable and used in South Asian cooking. 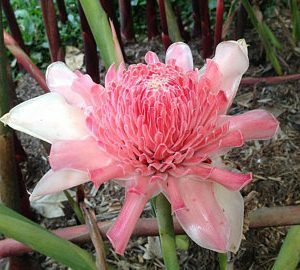 When growing this ginger give it plenty of room to expand it’s root system. Fertilization of potassium is a must for optimal growth and flowering.